Glenfarclas 21 year-old single malt is like drinking Sherried velvet. 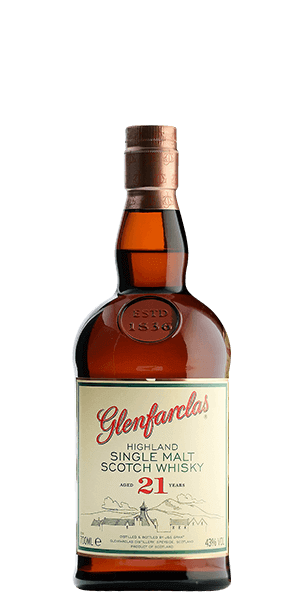 Glenfarclas 21 Year Old is rich and thick with a heavy influence of the Sherry casks it has aged in for more than two decades. In many ways, this fine single malt is a classic Speyside-style Whisky. But in other ways it is totally different. The complex aromas and fruitiness are there like other Speyside spirits, but there is a buttery richness that stands out uniquely. And the full bodied mouth-feel is nearly Liqueur-like in texture, but the flavors are balanced and well-rounded. What does Glenfarclas 21 Year Old taste like? The Flavor Spiral™ shows the most common flavors that you'll taste in Glenfarclas 21 Year Old and gives you a chance to have a taste of it before actually tasting it. Deeply complex with notes of caramel apples, banana, rancio, warm pecans, buttery malt, and more. Rich with dark chocolate raisins and figs with toffee and a little smoke. Interesante. Aromas a frutas secas y madera. Retrogusto potente. How do you know what monkey piss tastes like? I rate whisky by taste. As this was from a sherry cask, and I love whiskies from sherry casks it was perfect. Go with the 12 year. Can taste a bit of the raisin here. Good. But not twice as good as the 12. I must say I disagree. I feel the spirit came to fruition in 21 years. The 12 is also an excellent choice. But mmm that 21. The 25 is not so much worth the jump in price in my humble opinion. Nice! Full flavored and sweet with a touch of brandy and fruitiness. Not my cup o tea, it is probably one of the best for those with tolerable palats, but it was a little too harsh in the finish for me. Literally one of the greats. The 21 year old is awesome and is the best I have ever tasted. By far the best in the series! Don't waste time on the 10 and 12. Pay the extra for the 17 or 21.